“If you don’t know who Mr. Best is, then you aren’t on Team 604.” Few teams are as fortunate as FIRST Team 604 to be blessed with many dedicated mentors. Among them, Dr. John Best stands out for his expert guidance in anything technical. With a Ph.D. in Applied Physics and experience as a lab director at IBM research, he brings his wealth of expertise to the team. He eagerly shares his vast knowledge of technology, electronics and management. He continues to be involved FIRST even though his son graduated to college three years ago. “Mr. Best,” as the team fondly calls him, was among the first volunteer coaches when his son’s elementary school began to compete in FLL in 2000. After coaching FLL for 6 years, Mr. Best remains involved in FLL as an organizer of the Quixilver Qualifier and a judge at FLL tournaments. Mr. Best became involved in FRC in 2007, when his son joined our team. He immediately instituted project reviews early in the design process, involving the entire team and other parent engineers. He has thus ingrained the importance of project management in Quixilver, allowing for quick and efficient problem-solving. He installed a CNC machine and manual lathe in his garage, “The Leland Shop Annex,” helping students fabricate parts for robots and physics projects. He also helps the team with electronics board layouts, component choice, debugging code, and troubleshooting the mechanical design. He ran workshops to help switch the programming language from Labview to C++ and Java. FIRST is his passion. has been a member of the SVR planning committee for the past 5 years, and he has organized the regional kickoff, streamlining the distribution of kits from hours to 20 minutes. He has been a robot inspector for 6+ years at He even takes calls from other teams’ FRC mentors at 2 AM. What makes Mr. Best stand out is his unique approach to mentoring. He lets students make their own decisions, and fosters creativity and problem-solving skills. He is a teacher at heart, whether he is sitting on the floor teaching team members how to solder and crimp, or standing in front of a whiteboard drawing out designs for the robot. Such instruction has enabled the team members to become effective communicators. 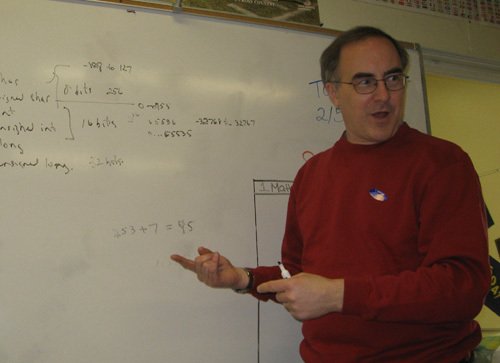 His in-depth knowledge and knack for teaching has made many topics in physics and math understandable for students, many of whom have gone on to major in STEM fields. Alumni still keep in touch with him. His gentle approach, ever-present smile and calming voice make him one of the most approachable mentors. From his start in FLL, to his valuable mentorship of Team 604, to his overarching reach as inspector and planning committee member, Mr. John Best has contributed to the education of hundreds of students and has proven that out of all mentors, he truly is the best.